Popular Twin Cities singer Christine Rosholt died suddenly last Wednesday. Today, January 3, would have been her 47th birthday. Her favorite color was red, and she was famous for her red lipstick; she wore a pair of jeweled red lips on a chain around her neck. 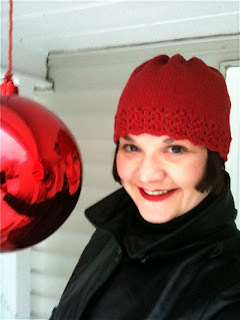 When I told her I wanted to make her a hat and asked what color she preferred, her immediate answer was "Red!" I sent her hat in early 2010, and she responded with this winsome self-portrait. Christine was a good and faithful friend to MinnPost, and when co-founders Joel and Laurie Kramer learned of her death, they asked me to write about her. It was a privilege, but it didn't come easily. Earlier this morning, when my piano teacher, Stephen Dewey, stopped by for my biweekly lesson, I told him the sad news. I wasn't sure if he knew Christine, but of course he did; almost everyone involved in music in the Twin Cities must have heard her name or seen her perform at some point during her too-short career. Turns out Stephen had attended the prestigious Yale Cabaret Conference with her in 2009. Part of the conference includes critiques designed to improve performers' stage presence. According to Stephen, Christine, who loved hats, was advised to move the one she was wearing back a bit so people could see her more clearly. "Why?" she retorted. "I can see all of you perfectly well." How sad! I enjoyed watching her sets. She will be missed!